Opera becomes the first web browser to offer a built-in Free, unlimited and 256-bit encrypted VPN service for everyone. Opera's Free VPN protects unencrypted browser session from leaking on public WiFi networks and will also let unblock firewalls to improve privacy and security. Virtual Private Networks (VPNs) have become an important tool not just for large companies, but also for individuals to improve web privacy, dodge content restrictions and counter growing threat of cyber attacks. Opera has released an updated desktop version of its web browser with a Free built-in VPN service to keep you safe on the Internet with just a click. For those unfamiliar, VPNs are easy security and privacy tools that route your Internet traffic through a distant connection, protecting your browsing, hiding your location data and accessing restricted resources. Unlike several other free VPN services, Opera's built-in free VPN service will offer you unlimited data usage as well. You just have to turn on a virtual switch in the Settings menu to enable the feature. So you required to install no third-party extensions, pay no monthly fee as well as set no limit on data usage. "By adding a free, unlimited VPN directly into the browser, no additional download or extensions from an unknown third-party provider are necessary," Opera's engineering chief Krystian Kolondra wrote in a blog post. "So, today, our Opera desktop users get a handy way to boost their online privacy, as well as easier access to all their favorite online content no matter where they are." Opera's Free VPN service uses 256-bit encryption to hide all your connection details and replaces your IP address with a virtual one, making it difficult for the government or anyone to trace your location, identify your computer or block content they do not want you to see. 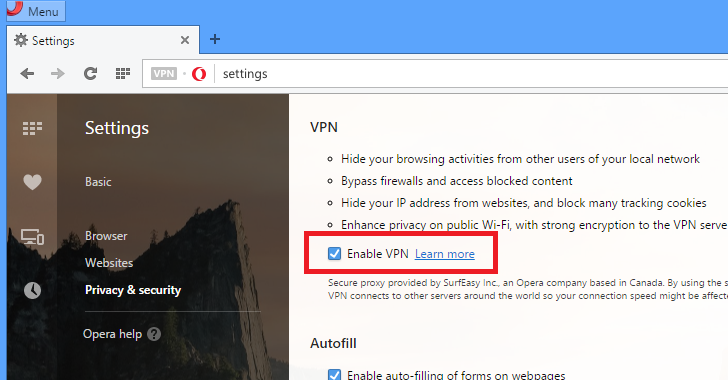 The free VPN feature in Opera has been made possible after the company acquired VPN provider SurfEasy last year. To give Opera's Free VPN a try, install the latest developer version of Opera for Windows and Mac, look for the 'Privacy & Security' tab and toggle this feature ON. Since Operas Free VPN service is available in the latest developer version of Opera, the service lets you switch between three virtual locations: The United States, Canada, and Germany. However, the company says it will add more countries in the stable version of its browser.